While it’s premature to discuss whether or not Congress will pass some sort of bailout package in the near future, it’s not too early to discuss ways we can profit if and when the market does eventually stage a turnaround. I know you’re tired of me talking about the VIX, but it has been a very good indicator of market climate and had you reduced your holdings according to the VIX levels that I’ve mentioned in the past (see July 14 blog: The VIX, the Market, and the Investor ) your portfolio would be mostly (if not all) in cash. But you won’t need to wait for the VIX to drop below 20 to start investing again, even if your investment philosophy is ultra-conservative. Over the next few days, we’ll be looking at strategies that I feel will be the most profitable once the market rebounds. Sure, some of the following strategies are risky, but there will be many that you non-risk takers will find palatable. First of all, I don’t think yesterday’s huge drop constituted a market bottom. Why? The unscientific answer is that it just didn’t feel like one, and chart-wise, it doesn’t look like one, either. During the 2000-2003 tech shake out, the S&P spent over two years in decline putting in five lower lows before forming a triple bottom that marked the end of that bear market. This time, we’re only 21 months or so into this decline with the S&P putting in only four lower lows. Of course, the dynamics of each bear market are different, so who knows if we’re going to hit another low before capitulation? Although I’m not an economist and can’t claim to understand the intricacies of credit swaps, I think we will see at least one more low and I also think that the VIX is going to break the 50 mark before heading back down. That’s the bad news. The good news is that we can spend some of this time on the sidelines figuring out our course of action when the market does recover. Here’s a sampler of a couple of plays on the volatility index that you folks with a taste for adventure might want to consider. They’re some of the riskier plays I’ll be mentioning and unfortunately they do require knowledge of options, so please don’t try these unless you know what you’re doing. 1. Bear call credit spreads using near-term options (October or November). A bear call spread is one where you sell the lower strike call and buy a higher strike call for a net credit. I’d recommend selling a 35 or 40 strike as the lowest strike and I’d do it ON THE DAY the VIX hits its next high. Remember that your maximum loss is limited to the difference in strike prices less the net credit. 2. Bear put debit spreads using medium term options (December and later). A bear put spread is one where you sell the lower strike put and buy the higher strike put for a net debit. If you’re a nimble options trader, the best way to play this one is to leg into it by buying the higher strike put at VIX tops (market bottoms) and sell the lower strike put when the VIX has declined. The reason I suggest a debit spread instead of just buying a plain put is that the spread somewhat mitigates the higher cost of the puts as compared with the calls (because of higher implied volatility in the puts). I’d stick with spreads that have break-even points above 30; more conservative investors should stick to break-even points above 35. I’ve found from painful personal experience that it’s best to close out an options position when there’s little profit left to be had just in case the market does the unthinkable, even if it’s only one hour before expiration. When it comes to options, it’s much better to be safe than greedy. In the next few days we’ll look at ways of playing other market indexes, sector ETFs, and select stocks. Back from vacation (boo!) and am watching the vote on the floor of Congress regarding the bailout. It’s a real nail-biter as the vote is close as of the time of this writing, and I’m thinking that this is a great opportunity for those of you savvy options players. 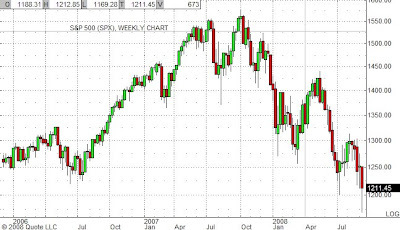 If the bailout passes, the market is poised to soar. If not, I do believe the market will tank and badly. This type of situation screams for a straddle on the tracking stocks or the indices. I know I’m late getting this out, but if you don’t have time to put on this type of trade, it’ll still be interesting to watch. For all of you conservative players, I dearly hope you’re in cash. Dr. Kris is out in the field doing research this week. The Stock Market Cook Book will return to its regularly scheduled time slot next week. Stay tuned for some new recipes! There was an interesting article in Sunday’s Los Angeles Times’ finance section (which is also the real-estate/home section, another ugly by-product of downsizing) that said that because of the rising grocery prices and a renewed interest in all things great and green, gardens are suddenly becoming popular. According to the article, sales at Burpee and other seed companies are up 30% this year alone as are sales at Armstrong Garden Centers, a local garden supply chain. Digging for profit potential, I looked at the charts of gardening-related companies. Unfortunately, there are no publicly traded companies along the lines of an Armstrong’s which means that we’ll have to look at the broad-based retailers in the home and garden category. This includes Home Depot (HD), Lowe’s (LOW), Conn’s (CONN), Tractor Supply (TSCO), and Sears (SHLD) which owns the Orchard Supply chain. The charts of the other three stocks look much more compelling. I like Conn’s and Tractor Supply the best. Conn’s broke out of a nine month base last week on heavier than normal volume. Tractor Supply is breaking through overhead resistance at $45 and if we get another day of confirmation, this would be a good entry point. Sears has already risen over 40% since July and is butting up against the $100 level. If it can break through that, I’d suggest entering maybe a half position since it’s already had a good run-up. That’s about it for today. I’ve heard from one reader how he’s getting tired of me yakking about the VIX (and frankly, I am too) so I decided to go with something completely different. So plant some seeds into this group and watch your profits grow. Hey, who said money doesn’t grow on trees? Spike in the VIX = Market Capitulation? I’ve been talking about the VIX for the past several days saying that market capitulation is at hand. Well, today I do think we got our capitulation as the VIX (volatility index) hit a record high, at least since it was redefined in 2003. The major averages are all putting in bottoming tails, and are recovering nicely going into the close. Let’s keep our fingers crossed that the worst is over. I gritted my teeth and hung in there with Bluegreen (BXG). The stock almost made it back to $9 but interest waned near the end of the day where it closed at $8.86. Anyway, it’s not a done deal until tomorrow when a definitive agreement is expected to be signed by the end of the day. Today’s five point volatility in Constellation’s stock may have been a reflection of investor uncertainty, and how can you blame anyone for thinking that the Constellation shareholders aren’t going to have something to say about it? Is There No End to this Misery??? I thought yesterday that perhaps we’ve seen the worst what with the VIX closing above 30. Silly me. Good thing I didn’t buy those index calls! There’s so much media speculation concerning how we got into this mess, how much further do we have to go, and who’s ultimately to blame. The playing field is already too crowded and the focus of my blog is more on the interpretation and implementation of technical patterns rather than on the economic forces behind them. Okay, so the financial system is collapsing. Were our portfolios prepared for such a downturn? Do we have a plan for when the market turns around? That’s why I’m here. My goal is to educate the reader so that he or she will be able to discern the climate of the market and know what strategies to implement. There are plenty of financial blogs that thrive on speculation and finger pointing, and many interesting and sometimes heated discussions that ensue. This blog is not one of them. Sure, I’d love more feedback and I encourage it, especially comments that focus on the technical (although I certainly won’t discourage thoughtful comments on other subjects either). Just in case you’re still in the dark as to my mission statement, it’s to educate the reader about market technicals (see Cooking Tools) and arm him with viable trading strategies that he can employ under the prevailing market climate (see Recipes). Okay. I’ll step off my soapbox. For now. So, where were we? Oh yes, the VIX. It took a huge gain today, marching steadily upward where it ended today’s rotten session at 36 and change, closing in on its recent high of 37.5. Because of the unprecedented happenings in the financial market, nobody really seems to know much of anything with forecasts as to when this mess will end ranging from tomorrow to a generation from now. This is uncertainty at its best (or worst, depending on your point of view) and I’m betting that the VIX might hit 50 or even higher before everyone finally throws in the towel. Yes, I’m speculating along with everyone else. I don’t know, either. This type of market is something that hasn’t been seen in at least a generation or two. So, what’s the average investor to do? There are still some sectors that having been doing pretty well, most notably the regional banks (I wanted to cover them yesterday but other stuff got in the way), the retailers (see 8/21 blog), the airlines (because of falling oil prices), some of the homebuilders (see 9/8 blog), and of course our old favorites, the ultra-short contra ETFs. If you hold large positions in the latter stocks, I’d suggest taking some money off the table when the VIX heads below 25. That’s my rant for today. Maybe tomorrow Mr. Market will be in a better mood. Flash-memory maker Sandisk (SNDK) today rejected a $5.85 billion takeover bid by Samsung saying that it undervalued the firm. The offer translates into about $26 per share and represents a 73% premium over yesterday’s closing price of $15. Although this bid seems juicy, Sandisk shares were trading as high as $30 just last May. Today’s news caused the stock to jump $6 which probably represents a new price floor as the company said it’s open to other offers. I’m not going to jump on this one until a deal is announced and approved by the board. As I’ve mentioned before, whenever the market volatility index, the VIX, spikes over 30 (and especially over 35), a market recovery follows. Historically, this has never failed. (See the weekly charts of the VIX versus the SPX below.) The only variable to this equation is the length of the recovery. Some recoveries last for years while others only last for several weeks. Whatever the case, what are the best ways to profit from this market phenomenon? 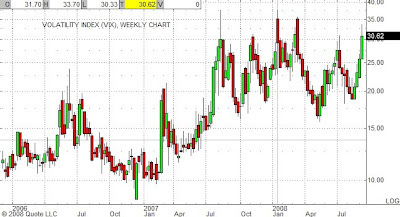 Fortunately we’ve already examined this in the July 15th blog, the last time the VIX rose over 30. This signaled a short-term rise in the market. In the four succeeding weeks, the S&P rose 90 points (over 7% ) before rolling over. Had we bought the tracking stock, the SPY, we would have made 8% (the tracking stock doesn’t track the index exactly), but if we had bought, say, the December 120 calls, we would have made around 40% on the trade. Remember now that I’m assuming perfect timing, something that’s much easier to accomplish in theory than it is in practice. We have the cue when to enter the trade, but the exit timing is more nebulous. A trailing stop or a trendline stop is better than no stop in this case. So, if you want to make a play on declining volatility (although past performance is no indication of future success blah blah blah), check out your favorite tracking stock and put on a position in either the stock or a bullish options play, depending on your level of expertise and risk. On July 23rd, Japan-based Tokio Marine entered into a merger agreement with property and casualty insurer Philadelphia Consolidated (NASDAQ: PHLY). The $4.7 billion all-cash deal stipulates that Tokio Marine would acquire all outstanding shates of Philadelphia Consolidated for $61.50 per share and is subject to the usual shareholder and regulatory approval. Phillie’s stock has been recently trading in the $59-$60 range but took a tumble yesterday along with the rest of the insurers. As soon as the stock showed some signs of life earlier this morning, I picked some up at $57.02 for an expected return of almost 8%. Bluegreen (BXG) fell below my target sell of $9.00, but is currently trading above that. If it can stay above $9.00, I’ll keep holding onto it. Photon Dynamics (PHTN) gapped down today on no news and is now trading at preannouncement levels. Barring a fundamental change in the company, I don’t see any reason to get rid of it. However, if it falls below $12, I might have a change of heart. It sure would be nice to know what’s going on, though. I’ve checked a few of the more popular message boards and haven’t seen anything. Huh. Today’s market implosion in the financials have spilled over into our mergers and acquisitions portfolio, the MANDA Fund. All of the funds five holdings are down today, and although the damage is hardly on par with AIG and Lehman, I do feel it’s my fiduciary duty to examine the portfolio and give guidelines not only for current holdings but for future acquisitions as well. Bluegreen Corporation (BXG) fared the worst today but not because of any financial fallout. A company press release said that Diamond Resorts, the acquiring company, needs more time to conduct its due diligence, extending its exclusive agreement to November 15th. No other details were given leaving already nervous investors to speculate as to why the deal is being held up. The stock closed down 13% at $9.54, just above its intra-day low. It’s tough to say what would have happened under more normal circumstances, but I’m thinking investor reaction might not have been nearly so severe. But that doesn’t mean that I’m going to watch the price slide much further. I’ll give it a some wiggle room based on continued uncertainty but if it falls below $9, I’m getting out. I don’t want to be there if the price sinks to its $6 preannouncement level. Photon Dynamics (PHTN) was down over 5% on no new news. As has been noted in recent blogs, the stock tumbled several days ago on what appeared to be investor jitters over the soundness of the deal’s financing. Today’s decline pretty much mirrored the movement of the S&P so I’m thinking that the price action is just a reflection of investors’ fears. I’m hanging onto this one until something happens, one way or another. The other three holdings—Rohm & Haas (ROH), Community Bankshares (SCB), and Lincoln Bancorp (LNCB)–are all down slightly riding on the market’s coattails. I won’t be parting with any of these unless there’s a good reason to do so. Community Bankshares just announced that it’ll be paying a twelve cent dividend on September 30th, by the way. Although we’re going through a very rocky period, I still intend to add to positions to the MANDA portfolio but I’m going to be a bit more rigorous in my selection criteria. No way an I touching the Merrill/B of A deal, at least not until some of the dust clears. Besides, I don’t particularly like stock-swap only deals. As always, cash is king. Especially in this market. It comes as no surprise that market volatility has spiked over the dreaded 30 mark twice today—once at the open and again going into the close. If history is any indication, we can expect volatility to be high for a while which means that now is NOT a good time for risk-adverse investors to be taking on new long positions, as if I even have to mention that! But I’m getting of the mind that a bottom in the financials could be put in the next month or so, providing that the previous bottom reached on July 15th holds. 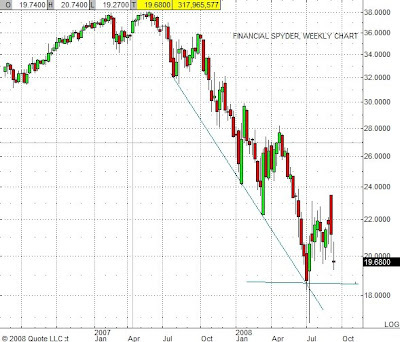 Below, the weekly chart of the XLF, the Financial Spyder (read: ETF), shows that its trendline has been hit four times. Predictive chartology tells us that the chances of a stock recovering after four such dips is much greater than with only three. Of course, that doesn’t mean that further declines aren’t possible, but what it does mean is that we should start keeping an eye on it and research individual companies for potential winners when the group finally does turnaround. Yes, today is indeed one of the gloomiest trading days in recent history but being a contrarian, I’m finding some cheer here that everyone seems to have thrown in the towel, for a return to the happy days of yore will not occur before we experience complete capitulation. At least that’s my humble opinion. My stomach is growling so after a lunch of cheesy cauliflower soup that Fifi’s whipping up, I’ll post another blog discussing today’s market action on the MANDA portfolio and what actions, if any, need to taken. See ‘ya in a few! You are currently browsing the Stock Market Cook Book blog archives for September, 2008.